After struggling against New Hampshire (TOR) in three straight games to close out the previous period, Almanzar began to cash in on the familiarity, closing out the home series going 3 for 4 with a double and taking the show on the road and going 4 for 10 with a double and a home run over next three games in Manchester. Since returning to the Red Sox organization and Portland the man affectionately referred to by some as Tiger Death House is batting .296/.397/.463 (16 for 54) with two home runs and three doubles in 17 games. Ball bounced back from a rough outing his last time out to work five scoreless innings, allowing two hits and striking out four against Asheville (COL) July 19. His July numbers show some encouragement that he may finally be breaking out of his season long slump having allowed seven earned runs on 12 hits for a 3.32 ERA in 19 innings pitched over four starts. This is his second SoxProspects.com Pitcher of the Week honor having previously won for the week of June 30-July 6. 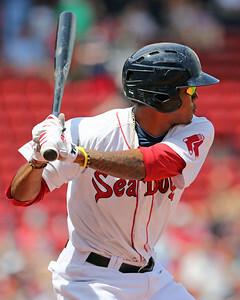 He is currently the sixteenth-ranked prospect in the organization by SoxProspects.com.